1.Turn on the power,the indicator light is on,press the button,turn on the spray mode,then press it. 2.Long press the switch,open the colorful night light mode,color is changing,continue to press the switch,the current color fixed to stop the gradient. MULTI FUNCTION - 7 Colors colorful night light + air humidifier + aroma diffuser ,this small humidifier can meet your different needs. AUTO SHUT OFF - After 4 hours of continuous use, the humidifier will automatically power off,the cool mist humidifier also can stop working automatically when water runs out.It is safe for using. 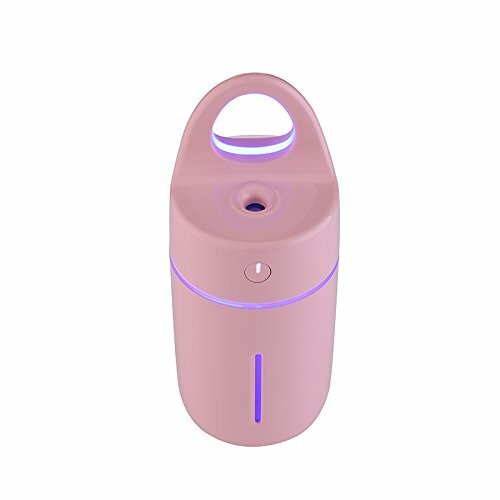 LOW POWER CONSUMPTION AND PORTABLE - This travel humidifier is powered by USB cable,plug and play.It can continuous 4 hours working to provides you a safely breathe and comfortable sleeping and its mini design allows you to carry this mist humidifier to anywhere. ULTRA QUIET - This humidifier aromatherapy diffuser is extremely quiet when working.gives out ultra fine and smooth mist which can helps you breathe better when you are sleeping with air conditioner on. SAY BYE TO DRY AIR - Azmall essential oil diffuser can protect your living airs fresh and clean, Improve the air quality and helps to reduce stress/pressure at work.suitablet for Home,Office,Bedroom,Living Room. If you have any questions about this product by Azmall, contact us by completing and submitting the form below. If you are looking for a specif part number, please include it with your message.